Installing and adjusting brake rods, I pulled back the handle to lock up the brakes. The left wheel locked solid, but I could turn the right one back and forth a couple of inches. Looking more closely, I could see that the drum and hub weren't budging, but the tire was moving. I guess it's a good thing I stocked up on Anderson wheel bolts at Hershey. Sounds like the holes between the spokes are probably wallowed out. 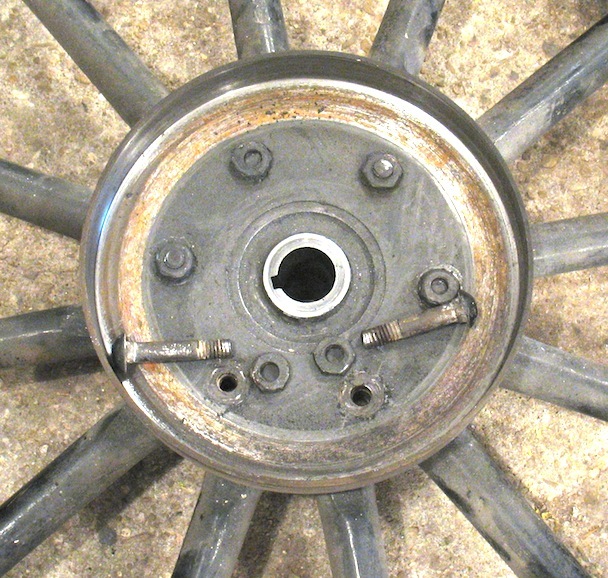 Since you have a wheel press, it might be a good idea to re-clock the hub and drill new holes one spoke over from the old ones, then bolt it up using all new bolts. Do you have split shoes Steve? Looks like they've been tilted out and hitting the drum. The wheel was moving but not the drum/hub. What's loose? The car had original one-piece brakes, but they were broken, and not in the usual place. The broken-off piece of brake shoe made those marks on the drum. The spokes are loose enough to let the felloe and rim move a little. I haven't taken the drum off to look yet, but Mark's probably right about the holes being "wallered" out.